The CANDU system is a strong example of safety through both engineered redundancy and passive design. The core has numerous triple-redundant detectors that feed to two logically, conceptually and physically separate shutdown systems (shut-off rods and high-pressure poison injection). Each system is capable of shutting down the core within 2 seconds following a LOCA ("Loss-of-Coolant Accident" -- the design-basis accident for CANDU reactors), without credit given to operator intervention. See the next FAQ for a more detailed discussion of the engineered CANDU safety systems. The subdivision of the core into two thermalhydraulic loops (in most CANDU designs), and hundreds of individual pressure tubes within each loop, localizes a LOCA (Loss-of-Coolant Accident) to one small region of the core, and reduces the reactivity effect of a LOCA accordingly. Furthermore, the two core-passes per loop mean that only a quarter of the core would likely suffer a mismatch between heat generation and removal under such conditions (and only the highest-power fuel elements within this one-quarter-core region). The large-volume, low-pressure, low-temperature moderator surrounding the pressure tubes acts as a heat sink in large LOCA scenarios, rendering negligible the risk of "fuel meltdown". The moderator, in turn, is surrounded by a thick light-water shield tank (used for biological and thermal shielding) which can also act as a heat sink in severe accident scenarios. The moderator also provides a low-pressure environment for the control rods, eliminating the "rod-ejection" scenarios considered in PWR safety analyses. In addition, the location of neutronics measurement devices in the moderator avoids subjecting this equipment to a hot, pressurized environment. Heavy-water neutron kinetics is slower by several orders of magnitude than light-water kinetics, reducing the discontinuity between prompt and delayed kinetic behaviour, and making control easier. Criticality of CANDU fuel bundles in light water is impossible, avoiding one concern of severe accident analyses that light-water reactors must contend with. Furthermore, since the geometry of the CANDU core is near optimal from a reactivity standpoint, any rearrangement under severe accident conditions ensures shutdown. On-power refuelling means that the power distribution reaches an equilibrium within a year of start-up, and remains virtually unchanged for the reactor's operating life. This greatly simplifies the analysis of core behaviour as a result of postulated accidents. On-power refuelling also allows defective fuel to be detected and removed from the core, reducing the contamination of the reactor coolant piping and simplifying maintenance. The low excess reactivity of the CANDU core leads to relatively low reactivity worth of the control devices, limiting the potential severity of postulated loss-of-regulation accidents. The positioning of the steam generators well above the core promotes natural thermosyphoning (i.e. movement due to the coolant's own density differences), which can remove decay heat if shut-down cooling is lost. At the same time, the large amount of small-diameter piping in the feeder network acts as a natural "radiator" under such conditions. This significant amount of inherent, or "passive", safety in the CANDU system, in conjunction with fast-acting, robustly engineered safety systems and backup safety systems, is the reason why a complex technology like nuclear power can be one of the safest and most reliable energy options available. The safety philosophy of CANDU reactors  is based upon the principle of "Defence-in-Depth", which includes redundancy (using at least two components or systems for a given function), diversity (using two physically or functionally different means for a given function), separation (using barriers and/or distance to separate components or systems for a given function), and protection (seismically and environmentally qualifying all safety systems, equipment, and structures, including tornado protection). This philosophy is applied throughout the plant design, from the Reactor Regulation System and Special Safety Systems, to the process control systems, and the electrical power supply (including independent, separated supplies of backup power supply). The philosophy is also embodied in the Secondary Control Area (SCA) of CANDU plants, which is a backup control room capable of independently shutting down and cooling the reactor, as well as monitoring plant status. The Reactor Regulation System (RRS) is part of a fully computerized control system that is also responsible for boiler pressure and level control, unit power regulation, primary heat-transport pressure and inventory, and turbine run-up. The RRS includes two identical, independent digital computers, each capable of complete station control. The two computers run simultaneously, one acting as instantaneous back-up to the other. In keeping with the Defence-in-Depth philosophy, each system is independent of the others, employing its own sensors, logic, and actuators. Each system uses triplicated logic (three sensor circuits, with two-out-of-three voting), with the ability to be tested on-line. Shutdown System 1 uses solid shutoff rods, dropping by force of gravity into the core, and is capable of shutting down the reactor for the entire spectrum of postulated initiating events. Shutdown System 2 uses high-pressure liquid poison injected into the (low-pressure) moderator, and is also capable of shutting down the reactor for the entire spectrum of postulated initiating events. The Emergency Core Cooling System (ECCS) can maintain or re-establish core cooling by supplying coolant to all reactor headers. It consists of three phases: high-pressure water injection using pressurized nitrogen (used during the early stages of an event), medium pressure water supply from the containment building's dousing tank (used during the intermediate stages), and low-pressure water supply based on recovery from the building's sump. The Containment System forms a continuous, pressure-confining envelope around the reactor core and primary heat-transport system. In the CANDU 6 design it consists of a pre-stressed, post-tensioned concrete structure, an automatically-initiated dousing system, building coolers, and a filtered air discharge system. In Ontario Power Generation's multi-reactor designs (the Ontario utility formerly known as Ontario Hydro), containment includes a vacuum building connected to all reactor vaults in the plant, with its own dousing system for reducing internal pressure. The safety systems of each CANDU plant are designed to meet international standards of reliability, and are tested routinely to ensure compliance with these standards. R. Shah (AECL), "Safety Concepts and Their Implications with Respect to NPP Instrumentation and Control - Canadian Practice," IAEA Interregional Training Course on Instrumentation and Control of Nuclear Power Plants , Karlsruhe Research Centre, Germany, 24 April - 24 May 1995. In any type of reactor the void coefficient refers to the reactivity feedback (the increase or decrease of the fission rate, and thus the rate of heat generation) that occurs if coolant in the core turns to steam or otherwise disappears. In PWR's and BWR's this coefficient is negative because a decrease in coolant density leads directly to a decrease in overall neutron moderation (the slowing down of neutrons by scattering) – the higher the degree of coolant voiding, the more negative the reactivity feedback (decreasing the fission rate). In CANDU reactors , the coolant and moderator are separate heavy water circuits, with the coolant making only a minor contribution to overall neutron moderation. Therefore, a loss of coolant (or a decrease in coolant density) would not be expected to affect neutron moderation significantly. Furthermore, since the coolant does not significantly absorb neutrons either, one might suspect that its disappearance would have no reactivity effect at all. In fact, the coolant does account for a small amount of moderation in CANDU reactors – just enough to "knock" fast neutrons down into the resonance energy range. This is an intermediate energy range where a neutron's probability of parasitic absorption in uranium-238 (absorption without causing fission) is enormous. Since this small amount of moderation takes place in a location close to the fuel (i.e., the neighbouring coolant), the situation arises, under normal operating conditions, that some neutrons are decelerated by "just" the right amount, and in "just" the right location, to account for a significant amount of parasitic absorption in uranium-238. It follows that a loss of coolant reduces the amount of resonance-energy neutrons around the fuel, while increasing the amount of fast neutrons (and hence fast fission). Both effects have a small positive reactivity contribution. Meanwhile, at the lower ("cooler") end of the neutron energy spectrum, the coolant actually "up-scatters", or increases the energy of, thermalized neutrons as they diffuse in from the surrounding moderator. This up-scattering occurs because the coolant temperature is much higher than that of the moderator (70 deg.C, versus 300 deg.C), and this temperature difference is enough to influence the average energy of low-energy neutrons (technically, neutrons in this energy range are said to be in, or approaching, thermal equilibrium with the moderating medium – hence the term "thermal neutrons" used to describe them). Making neutrons "hotter" (more energetic) makes them less likely to be captured and cause fissions in U-235 atoms. In a fresh core (no plutonium content) this provides a little more positive reactivity upon loss of coolant, because decreasing the average neutron energy means increasing the probability of fissions in uranium-235. On the other hand, as plutonium is created in the fuel (due to neutron absorption in uranium-238), the presence of a large resonance at the upper end of its thermal spectrum leads to a negative reactivity contribution upon coolant voiding. This occurs because the resonance in plutonium, unlike that in uranium-238, increases the probability of both fission and parasitic absorption for neutrons in its energy range. Upon coolant voiding, it turns out that the loss of thermal neutron up-scattering (described above) causes a net decrease in the fission rate in plutonium. Thus, due in large part to the presence of plutonium, the reactivity coefficient in an equilibrium CANDU core (after about 500 full-power days) is about half that of a fresh core. It should also be noted that the void coefficient is but one contributor to total reactivity feedback, and the power coefficient, which is of more importance to operational stability, is actually quite small (see next FAQ for a discussion of the overall effect on safety). Finally, the void coefficient is highly dependent upon fuel composition, and it is practically possible to "tailor" the coefficient within a wide range, simply by altering the fuel design. For example, coolant voiding is known to cause a slight shift of thermal flux towards the centre of the fuel, simply because more thermal neutrons, diffusing in from the bulk moderator, are able to survive the journey. It is possible, therefore, to modify the void coefficient by adding more absorption material in this inner fuel region. The void coefficient can be made zero, or negative. However, the nominal design using natural UO2 fuel, with a positive void coefficient, meets high safety standards recognized by the international community. J.J. Whitlock, et al, "Effects Contributing to Positive Coolant Void Reactivity in CANDU", Trans. Am. Nucl. Soc.,72, 329, ISSN: 0003-018X, 1995. J.J. Whitlock, Reduction of the Coolant Void Reactivity Effect in a CANDU Lattice Cell , PhD Thesis, McMaster University, Hamilton, Ontario, 1995. It is inappropriate to judge the safety of any system based upon one of its inputs. Firstly, you must consider the combined effect of all inputs simultaneously, which (as pointed out in the previous answer) actually leads to a small feedback under power ramping. Secondly, you must consider the system response to the inputs, especially under extreme conditions. In CANDU safety analysis, the "extreme condition" for fast reactivity insertion is a large LOCA ("Loss-of-Coolant Accident), and therefore the shut-down system is engineered to meet the speed requirements of such a scenario. There are actually two completely separate (physically as well as logically) systems, each capable of fast shutdown under large-LOCA-induced reactivity, and each tripped by triple-redundancy logic from two separate detection networks well-distributed throughout the core. The first shutdown system is spring-assisted shut-off rods, and the second (on most CANDU units) is high-pressure liquid poison injection. Unlike in other reactor designs, these systems trip on neutronic parameters to LOCA events, as opposed to those with longer thermalhydraulic time-constants. This provides an almost instantaneous indication of single-channel flow blockage, for example. In practice both safety shutdown systems are conservative because the core never voids completely in an instantaneous fashion, especially given the high degree of thermalhydraulic subdivision within the core. This reality is not conveyed by a simple coefficient, which, for example, does not account for the fact that only half the core would void in a worst-case scenario, and even then over a finite length of time. Also not conveyed by a simple coefficient is the core's dynamic response to insertion of positive reactivity. Unlike in light-water reactor cores, the insertion of sufficient positive reactivity to achieve "prompt criticality" in a CANDU core (i.e. the core becomes critical on the promptly-released fission neutrons alone) does not significantly shorten the core multiplication time constant such that engineered safety safety systems have difficulty maintaining control. In the heavy water core of a CANDU reactor, neutron moderation is sufficiently "sluggish" (it takes longer to slow neutrons down than in light water) to enable control under prompt critical conditions. This is an added inherent safety feature of CANDU reactors that lends additional perspective to the notion of positive void feedback. Finally, it must be remembered that any feedback coefficient is a challenge for safe control, if it is large enough or highly variable - regardless of its sign. A BWR, for instance, has a large negative void coefficient which must be handled by the safety system in scenarios involving massive void collapse (inducing positive reactivity). It is far more important to keep feedback coefficients small and independent of operating conditions, as is the void coefficient in CANDU reactors. For further reading on this issue see the two papers by Meneley and Muzumbdar that follow, which were presented at the Canadian Nuclear Society Annual Conference in June 2009. D.A. Meneley and A.P. Muzumdar, "Power Reactor Safety Comparison -- a Limited Review", Proceedings of CNS 30th Annual Conference, Calgary, AB, 2009 May 31-June 3. A.J. Muzumdar and D.A. Meneley, "Large LOCA Margins in CANDU Reactors -- an Overview of the COG Report", Proceedings of CNS 30th Annual Conference, Calgary, AB, 2009 May 31-June 3. On April 26, 1986, the Unit 4 reactor at Chornobyl*, near Kiev in the Ukraine, suffered the worst nuclear accident in history. A combination of poor design, almost nonexistent safety culture, and human error lead to an uncontrolled power increase that destroyed the core and dispersed radioactive contamination over a wide region of the Ukraine and Byelorussia. See the IAEA's summary marking the 20th anniversary in 2006: "Revisiting Chernobyl: 20 Years Later", as well as the World Nuclear Association's summary at http://www.world-nuclear.org/information-library/safety-and-security/safety-of-plants/chernobyl-accident.aspx. The tragic events of April 26, 1986 are in many ways peculiar to the type of reactor involved, the philosophy and training of those operating it, and the political infrastructure governing the country (the former U.S.S.R.) at the time. It is not likely that an accident like that at Chornobyl could happen in a commercial nuclear plant found in Canada or the U.S.A. The root cause of the Chornobyl accident was a design flaw in the shut-down system which inserted positive reactivity under the operating conditions and core configuration found immediately prior to the accident . No other reactor design in the world has this design flaw, including the CANDU reactor. A contributing cause of the Chornobyl accident was the positive reactivity inserted due to coolant voiding. In the RBMK design the void coefficient is sensitive to power level and core configuration, becoming six times higher just prior to the accident. The RBMK shut-down system, which had to be tripped manually, is insufficient to handle this amount of reactivity. In CANDU reactors the void coefficient is stable against power level and core configuration, and sufficiently covered by two independent, fast-acting shutdown systems tripped automatically. The safety system in the RBMK design is intermixed with its control system, and it is thus possible to override key safety systems by making manual adjustments to the control system (as the operators did prior to the accident). The CANDU safety system is independent of the control system, and interlocks prevent operator override. Chornobyl was placed in a precarious operating condition by manual spatial control of the core, and neglect of operating procedure. Spatial control of the CANDU core is automatic, while CANDU operators are rigorously trained and follow strict doctrine at all times. The Chornobyl reactors have no containment, and the key factor in the widespread dispersion of contamination was the energy released from the burning graphite moderator. CANDU reactors, like most Western designs, have a containment structure designed for its maximum credible accident, while its moderator is low-temperature, low-pressure water. * "Chornobyl" is the correct Anglicized spelling of the Ukrainian name (as opposed to the Russian version "Chernobyl", used prior to the separation of the Ukraine from the former U.S.S.R.). See discussion at US DOE website. P.S.W.Chan, A.R.Dastur, S.D.Grant, J.M.Hopwood, B.Chexal, Multidimensional Analysis of the Chernobyl Accident, AECL Technical Report, AECL-9604, January 1988. J.Q. Howieson and V.G. Snell, "Chernobyl: A Canadian Technical Perspective", AECL Technical Report AECL-9334, January 1987 (also released as an AECL Public Affairs brochure, "Chernobyl: A Canadian Perspective", July 1988). On April 26, 1986, the Unit 4 reactor at Chornobyl, near Kiev in the Ukraine, suffered the worst nuclear accident in history. A combination of poor design, nonexistent safety culture, and human error lead to an uncontrolled power increase that destroyed the core and dispersed radioactive contamination over a wide region of the Ukraine and Byelorussia. See the IAEA's summary marking the 20th anniversary in 2006: "Revisiting Chernobyl: 20 Years Later", as well as the World Nuclear Association's summary at http://www.world-nuclear.org/information-library/safety-and-security/safety-of-plants/chernobyl-accident.aspx. While the Chornobyl accident has little relevance to nuclear safety in CANDU and most other Western nuclear power plants (see related FAQ), the wide-spread nature of its environmental consequences and its generally high profile around the world supports an on-going interest in Canada and other countries. The immediate significant health effect of the accident was the death toll (mostly due to high radiation exposure) among the workers at the plant itself. Of this group, 31 died either at shortly after the accident, and 19 died subsequently over the next two decades (some not attributable to the accident however). In 2006 the United Nations published an update on the longer-term health effects of the Chornobyl accident, based on the epistemological research. With one notable exception, no evidence of any public health impact attributable to radiation exposure from the 1986 accident has been found. The exception is an increase in thyroid cancers found in people who were exposed in childhood after the accident (15 deaths had been documented by 2002). It has been suggested that this increase may be due to increased medical surveillance and improved diagnoses since the accident (leading, among other things, to the identification of occult carcinomas normally undetected clinically). While this certainly has contributed to the increase in thyroid cancer incidence, it cannot account for the total increase (see "Chernobyl Ten Years On: Radiological and Health Impact" at http://www.nea.fr/html/rp/chernobyl/c05.html). Regarding overall cancer incidence or mortality, no increase has been observed that could be attributed to the accident. The risk of leukemia (normally a sensitive indicator of chronic radiation-induced effect in a population, due to its short latency period and well-understood radiogenic behaviour) does not appear to be elevated, even among the hundreds of thousands of recovery workers who participated in the clean-up following the accident. There is also no scientific evidence of any other non-malignant disorder due to the accident. Nonetheless, the United Nations, in its "Chernobyl Forum" report, predicts an increase in cancer mortality of up to 4% (about 4000 extra fatalities) among the most highly exposed population of about 600,000 people, and an increase in cancer mortality of less than 1% in the broader "contaminated region" population of about 5 million people, based on statistical knowledge of past significant radiation exposures of large populations, such as at Hiroshima and Nagasaki. These increases would not be detectable against the natural cancer mortality of these populations. The lower bound of these mortality estimates is zero; i.e. no increase (the large range of uncertainty is due to the difficulty in estimating health consequences of low-level radiation exposure, given that such consequences cannot be directly observed and must be inferred from knowledge of past high-level exposures). The United Nations report states, "It is impossible to assess reliably, with any precision, numbers of fatal cancers caused by radiation exposure due to Chernobyl accident. Further, radiation-induced cancers are at present indistinguishable from those due to other causes." There is less uncertainty about the psychological, sociocultural, and economic legacy of the Chornobyl accident, associated not only with the forced permanent evacuation of a large population, but also with the continued perception within this population that its general health is at perpetual risk in a manner that is beyond individual control. The United Nations "Chernobyl Forum" report also addresses the social and societal impacts of the Chernobyl accident. The largest public health problems created by the accident were its effects upon the mental health of the people living in affected areas, including �lifestyle� diseases, such as alcoholism and tobacco dependency. Relocation proved a �deeply traumatic experience� for the people moved out of the affected areas, the study noted, while persistent myths and misperceptions about the threat of radiation have resulted in a �paralyzing fatalism� among residents of affected areas. Seeing themselves as �victims� rather than �survivors� has led to overcautious and exaggerated health concerns. In Canada off-site liability for a nuclear accident is insured under the Nuclear Liability and Compensation Act (2015). Under this legislation, which conforms to international conventions and is conceptually similar to legislation in other countries (such as Price-Anderson in the US), all liability up to a limit of CDN$1 billion is channelled directly to the operator. This means that a member of the public with a damage claim due to an accident at a nuclear reactor can obtain compensation directly from the operator, without having to prove negligence. Component suppliers are protected from public litigation (but not from litigation by an operator, for example to cover on-site damages). Under such a liability regime, the public is guaranteed an expedited claims process, and the right to collect on all justified claims. Should the CDN$1 billion limit be reached (there have been no claims to date), the Act authorizes the establishment of a government commission to oversee the balance of claims. For the benefit of nuclear operators and suppliers, such legislation provides a stabilizing influence, but should not be misconstrued as an incentive for reduced safety. Since operators have their own property at stake (valued at several billion dollars per reactor, sometimes insured privately and sometimes self-insured, depending on the size of a utility), and must operate under strict regulations for emissions and employee/public exposure, it is in their own best interests to ensure a high degree of safety and reliability in the components they are supplied, and in the operation of their plant. In any conceivable accident scenario where the liability limit is reached, it is almost certain that the owner's investment in the nuclear plant itself would be lost. The Nuclear Liability and Compensation Act replaces The Nuclear Liability Act (1976), which placed the operator's limit at CDN$75 million. In addition to raising the operator's limit, the new act introduces other improvements such as allowing the operator to obatain the required insurance through a wider variety of instruments (including self-insurance), expanding the type of damage that is applicable, and allowing a longer claims period (30 vs. 10 years). The case of the 1979 Three Mile Island (TMI) accident in the United States provides an international example of how third-party nuclear liability insurance might be paid out. Since the TMI accident just over US$100 million has been dispensed (although there was no significant off-site radiological consequence from TMI): US$76 million in public claims, US$25 million in reimbursements for economic hardship, US$5 million towards the establishment of a public health fund, and just over US$1 million to offset evacuation expenses. In Canada public property damage due to a nuclear accident is generally not included in homeowner insurance contracts since the coverage is provided under the NLA, by a pool of private insurers that thus avoids providing indemnification twice. On December 12, 1952 a combination of mechanical failure and human error led to a now-famous power excursion and fuel failure in the NRX reactor at AECL Chalk River Laboratories. At the time NRX was one of the most significant research reactors in the world (rated at that time for 30 MW operation), in its sixth year of operation. During preparations for a reactor-physics experiment at low power, a defect in the NRX shut-off rod mechanism combined with a number of operator errors to cause a temporary loss of control over reactor power. Power surged ultimately to somewhere between 60 and 90 MW over a period of about a minute (the total energy surge is estimated to be approximately 4000 MW-seconds). This energy load would normally not have been a problem, but several experimental fuel rods that were at that moment receiving inadequate cooling for high power operation ruptured and melted. About 10,000 Curies of fission products were carried by about a million gallons of cooling water into the basement of the reactor building. This water was subsequently pumped to Chalk River Laboratories' waste management facility, where the long-term ground water outflow was monitored thereafter to ensure adherence to the drinking water standard. The core of the reactor was left severely damaged. This accident is historically important, not only because it was the first of its type and magnitude, but also because of its legacy to Canadian and international practice in reactor safety and design. Nobody was killed or hurt in the incident, but a massive clean-up operation was required that involved hundreds of AECL staff, as well as Canadian and American military personnel, and employees of an external construction company working at the site. In addition the reactor core itself was rendered unusable for an extended period. Environmental effects outside the plant were negligible, as was radiation exposure to members of the public. The health record of AECL and Canadian military personnel involved in the clean-up was scientifically reviewed in the 1980s (no significant health effects were observed). the need to balance thorough safety coverage with simplicity that does not interfere unduly with operations. The accident also demonstrated that, due to a combination of redundant safety features, emergency procedures, and a level of inherent "forgiveness" (or robustness) in the technology, a major fuel-melt accident in a nuclear reactor can occur without significant environmental effects and radiation exposure to the surrounding population. The NRX core was completely rebuilt, improved, and restarted within 14 months following the accident (the first time something like this was attempted), and the reactor continued to perform for another four decades before being retired. As with the analysis of the accident itself, the clean-up and repair of the NRX reactor shed light on several new concepts of reactor operation and design. A major example of these is the complete rehabilitation of a large reactor core, which contributed to the unique long-term maintenance philosophy of not only research-reactors at Chalk River Laboratories, but also CANDU power reactors. Another summary of the NRX accident can be found here. Admiral Rickover of the US nuclear navy took advantage of the clean-up operation to train his men in the field. One of the young officers involved in the effort was Lt. Jimmy Carter, a nuclear engineer who in 1977 became the 39th president of the United States (and in 2002 a Nobel Peace Prize laureate). Rosalie Bertell, a popular figure in the Canadian anti-nuclear scene, claims in her 1985 book, No Immediate Danger? Prognosis for a Radioactive Earth (Women's Educational Press, Toronto), that the NRX reactor exploded and one man was killed. In fact, as described above, the reactor did not explode and nobody was killed, and this has been a matter of public record since the 1952 accident. Bertell is possibly confused by a Chalk River incident happening two years before the NRX accident. In December 1950 a worker named Stephen Whelan died when a container of ammonium nitrate exploded in a plutonium separation plant at the site; this incident is also in the public record. Lewis, W.B., "An Accident to the NRX Reactor on December 12, 1952", AECL Report, AECL-232, 1953 July 13. Hurst, D.G., "The Accident to the NRX Reactor, Part II"", AECL Report, AECL-233, 1953 October 23. Gilbert, F.W., "Decontamination of the Canadian Reactor", Chemical Engineering Progress, 1954 May (AECL-116). Gray, J.L., "Reconstruction of the NRX Reactor at Chalk River", The Engineering Journal, 1953 October (AECL-83). Hatfield, G.W., "A Reactor Emergency, with Resulting Improvements", Mechanical Engineering, 1956 February (AECL-164). Ophel, I.L., "Monitoring of Fresh Waters Used for Dispersal of Radioactive Wastes", Disposal of Radioactive Wastes, International Atomic Energy Agency, Vienna, 1960. Edwards, W.J., "Fission Product Release from the NRX 1952 Accident", AECL Report, AECL-1977, December 1963. Lewis, W.B. and Ward, A.G., "An Appreciation of the Problem of Reactor Shut-off Rods with Special Reference to the NRX Reactor", AECL Report, AECL-590, 1953 May. Cross, W.G., "The Chalk River Accident in 1952", Symposium on "Historical Perspective on Reactor Accidents", Health Physics Society, Seattle, Washington, July 21-25, 1980. Werner, M.M., Myers, D.K., and Morrison, D.P., "Follow-up of CRNL Employees Involved in the NRX Reactor Clean-up", AECL Report, AECL-7760, June 1982. "Mortality Follow-up of Canadian Servicemen Involved in Decontamination Duties at Chalk River and Observation of Nuclear Bomb Tests", prepared for the Department of National Defence by Statistics Canada (Occupational and Environmental Health Research Unit), June 1985. On May 24, 1958 a major fuel-handling accident occurred at the NRU research reactor facility at AECL Chalk River Laboratories. The NRU, one of the world's most powerful and versatile research reactors, was in its first year of operation (reactor design power: 200 MW). Although a major event in its own right, the 1958 NRU accident was not as significant as the 1952 NRX accident (see related FAQ) in terms of either the resulting damage to the reactor core or its legacy to the field of reactor safety. Unlike the events of December 1952, the 1958 NRU accident did not involve a power excursion in an operating reactor. It occurred while NRU was shut down and undergoing an operation to remove failed fuel from its core. While being removed the failed fuel rod did not receive adequate cooling and probably began burning in the fuel transfer flask above the core (the fuel used at the time was uranium metal, which combusts spontaneously in air). The fuel also broke apart, leaving one section in the bottom of the reactor and another section stuck in the transfer flask. As the transfer flask moved across the reactor bridge towards the fuel storage area beside the reactor, a three-foot section of the stuck fuel rod dropped from the flask into a maintenance pit on the bridge, where it continued to burn. The fire was extinguished relatively quickly (about 15 minutes) by reactor staff, but not before it had significantly contaminated the inside of the NRU building and, to a smaller degree, an area (approximately 0.4 square km) of the Chalk River site itself. Cleanup started immediately, along with repair of the reactor itself, and NRU was up and running again by August of that year. The clean-up involved a large number of personnel, including AECL staff, soldiers from CFB Petawawa, and workers from the Civil Defense Unit based in Arnprior, Ontario, and a commercial cleaning company in Ottawa, Ontario. All personnel were protected from contamination by special clothing, and radiation doses were controlled through timed work procedures, long-handled tools, and dosimetry on all workers that ensured adherence to legal limits. The health record of AECL and Canadian military personnel involved in the clean-up was scientifically reviewed in the 1980s (no significant health effects were observed). Greenwood, J.W., "Contamination of the NRU Reactor in May, 1958", AECL Report, AECL-850, 1959 May. White, J.M., "Health Physics Problems Following a Reactor Accident", American Industrial Hygiene Association Journal, vol.20, no.6, 1959 December. Greenwood, J.W. and Hughes, E.O., "Contamination and cleanup of NRU", Nucleonics, vol.18, 1960 January. Myers, D.K., Morrison, D.P. and Werner, M.M., "Follow-up of AECL employees involved in the decontamination of NRU in 1958", AECL Report, AECL-7901, 1982 September 1. Tritium (H-3) is a radioactive heavy isotope of hydrogen, created in the heavy-water moderator of CANDU reactors by neutron bombardment of deuterium (H-2, the hydrogen isotope in heavy water). Over a period of time a significant quantity of tritium builds up in the moderator, and since tritium is radioactive, with a half-life of 12.3 years, this poses a potential risk to employees, and also increases the potential for a tritium release to the environment. Tritium is considered a "low hazard" radioactive isotope, because of the weak energy of its radiation (beta particles with an average of 6 keV energy). Due to its low-energy radiation, it is harmless outside the body, but becomes a biohazard if taken internally. Regulations are therefore set on the amount of tritium that can be released from a CANDU nuclear plant, and CANDU operational targets are typically less than 1% of this value. To reduce the risks further, Ontario Power Generation (then known as Ontario Hydro) commissioned a Tritium Removal Facility (TRF) at its Darlington nuclear station (near Toronto, Ontario) in 1990. This facility chemically extracts tritium from the moderator water of all of Ontario Power Generation's CANDU reactors, using a two-stage process. Stage 1 is a vapour phase catalytic extraction (VPCE) process which extracts the tritium in vapour form. Stage 2 is a cryogenic distillation process which then distills the tritium at low temperatures and immobilizes it. Ontario Power Generation can process up to 2.5 thousand tonnes (2,500 Mg) of heavy water a year, producing about 2.5 kg of tritium with a purity greater than 98% . The utility then markets this tritium globally, for end-uses not associated with nuclear weapons. Ontario is one of only two major civilian producers of tritium in the world, the other being a Russian-British joint venture called Reviss Services Ltd., which uses the Mayak facility about 100 km from Chelyabinsk, Russia. The civilian uses of tritium include self-luminous lighting applications, fusion power research (for which it is a principal fuel material), and tracer applications in biological and pharmaceutical research. Ontario Power Generation fact sheets: (i) Tritium Removal Facility and (ii) Tritium Products. The annual limit on public radiation exposure from nuclear operations is specified in the NSC Act is 1 millisievert* (mSv), roughly equal to one-third the radiation dose that Canadians receive annually, on average, from natural sources (i.e., the rocks, plants, and air around us, and even our own bodies), and several hundred times less than that which is observed to have a health effect in human populations. Operators of CANDU reactors in Canada typically set their own operational targets at about 1% of the regulatory limit, or about 0.01 mSv, and in practice achieve much better than this. These criteria apply to a hypothetical "most-exposed individual", who spends 100% of his/her time at the boundary of the plant, eating only locally-derived produce, meat, fish, water, and milk. The average, realistic radiation exposure in the community surrounding a nuclear plant, due directly to the plant itself, will be hundreds and thousands of times less again. At this level the dose is millions of times less than that which is observed to have a health effect in human populations, and unnoticeable compared to the natural radioactivity of our own bodies. The amount of radiation that the public is exposed to from nuclear plants is a matter of public record, and both past and current information can be obtained on-line from the CNSC website (see above link), or from the utilities themselves (see, for example, the reports on the Ontario Power Generation website). [mih-lee-see-vurt] The sievert (Sv) is the standard unit of radiation dose, taking into account both the energy and type of the radiation involved in a given exposure (gamma rays, alpha particles, beta particles, neutrons, electrons, etc.). A millisievert (mSv) is one-thousandth of a sievert. Canadians, on average, are exposed to about 3.5 mSv per year, mostly (about 80%) from natural sources in the environment, including our own bodies. An older unit of radiation dose, still in limited use, is the rem. One Sv is equal to 100 rems (and one mSv is equal to 100 mrems). The act of regulating something often breeds apprehension, but quantities regulated for industrial use can be smaller than naturally-occuring quantities of the same material. For example, the following common items contain enough potassium-40 (a naturally radioactive form of potassium, found in concentrations of 1-part-in-10,000 within natural potassium) to require a license from the Canadian Nuclear Safety Commission (CNSC), had that same quantity of potassium-40 been isolated within a regulated nuclear industrial or laboratory setting: 9 kg of granite, 600 g of sodium-free table salt (KCl), 5 kg of all-purpose lawn fertilizer (7-7-7), 42 kg of cement, 112 kg of dry wallboard, 50 kg of Brazil nuts, 60 kg of lima beans, 80 kg of bananas, 80 kg of white potatoes, 80 kg of carrots, 80 kg of wood, 90 kg of red meat, 700 litres of beer, 250 litres of milk, or 3 average human adults. The level of radiation in all of these cases presents no health risk (and may even be beneficial), but the information sheds light on both the ubiquitous nature of radioactivity, and the conservatism built into regulatory limits. For more information on the radiation around us, and inside us, see "Radioactivity in Nature" from Iowa State University. For a general introduction to nuclear science and radioactivity, see "The ABCs of Nuclear Science" from Lawrence Berkeley National Laboratory (LBNL). A home-made cloud-chamber for "seeing" radiation is described in the author's brochure, "Radiation Encounter! ", along with more background information (PDF-format). Teacher and student resources are available at the Yes I Can! website operated by York University. Tritium is a radioactive form of hydrogen (H-3), with a half-life of 12.3 years. It is found in small amounts in nature (about 4 kg globally), created by cosmic ray interactions in the upper atmosphere. Industrial releases of tritium account for roughly 25% of the natural production. Tritium is considered to be a weak radionuclide because of the low energy of its radioactive emissions (beta particle energy 0 - 19 keV; average energy about 6 keV). The beta particles (similar to electrons) do not travel very far in air and do not penetrate skin; therefore the main biological hazard of tritium is due to its intake into the body (inhalation, ingestion, or absorption). Tritium levels in the atmosphere were elevated significantly by the atomic bomb tests of the 1950s and 1960s, in total adding about 600 kg (150 times the natural levels) to the global inventory. The concentration of tritium in the Ottawa River (Canada) in the mid-1960s reached as high as 1000 Bq/L, or over 300 times the natural concentration (less than 3 Bq/L). Since this time the levels of tritium due to the bomb tests have diminished to close to the pre-1950s values. Tritium is considered to be a very weak radionuclide: 1 million Bq (1 MBq) of tritiated water vapour is calculated to deliver a dose in adults of only 20 micro-Sieverts (0.02 mSv, or about 1% of annual backround exposure). For children the dose is 0.06 mSv for 1 MBq. The CNSC and the IAEA consider anything containing less than 1 billion Bq (1 GBq) of tritium to be exempt from regulation. Tritium is also created in nuclear power reactors: in CANDU reactors mainly by neutron absorption in the heavy water moderator, and in light-water reactors mainly by neutron absorption in boron in the coolant/moderator (boron is added as a neutron absorber to suppress excess reactivity in light-water reactors). Tritium is typically released within containment as "tritiated" water (heavy or light, depending on the reactor type) through routine water leakage routes (flanges, valves, fittings, etc.). In CANDU reactors almost all of it is recovered within containment, but about 1% escapes through the building ventilation system. Less frequently, a small amount of heavy water containing tritium will be released from the containment building, and typically diluted in a neighbouring waterway, as a result of a malfunction in the moderator or coolant system. As with all radionuclide emissions from a CANDU plant (see related FAQ), tritium is monitored in the surrounding environment through routine sampling of air, precipitation, milk, drinking water, fruits, vegetables, and other plants. Typical emissions are less than 1% of the regulated emission limits, which are based on international standards. For example, the Health Canada dose guideline for radionuclide concentration in drinking water corresponds to a maximum "committed effective dose" (i.e. the dose received over a 50-year period due to one intake) of 0.1 mSv per year (roughly 1/30 of average annual background exposure), which corresponds to 10% of the International Commission on Radiological Protection (ICRP) limit on public exposure (1 mSv/year - see related FAQ). For tritium in drinking water, this approach corresponds to a limit of 7000 Bq/L, assuming an average consumption of 2L per day or 730 L/year. Some confusion has been caused by the fact that other jurisdictions often choose different criteria, and thus arrive at different drinking water limits – some lower and some higher than Canada's. For example, the U.S. drinking water guideline is roughly 10% of Canada's limit, or 740 Bq/L, while the European Union uses 100 Bq/L, the World Health Organization (WHO) uses 10,000 Bq/L, Australia uses 30,000 Bq/L, and Finland uses almost 80,000 Bq/L. This variation does not represent a discrepancy in acceptable public safety, since all chosen criteria fall well below the ICRP standard, which itself represents a fraction of annual background radiation exposure, several hundred times less than levels which are observed to have a health effect. Actual exposures are thousands of times less again since water measurements around CANDU plants are typically less than 1% of this guideline. Put another way, over the course of one year a person would have to consume 20-30 tonnes (20,000 - 30,000 L) of water contaminated with tritium to the maximum Health Canada guideline (7000 Bq/L), in order to receive an additional radiation dose equivalent to that person's annual background dose. The low impact of historical tritium releases does not preclude the further lowering of these emissions as the CANDU design evolves. Enhanced versions of the CANDU 6 reactor, as well as the Advanced CANDU Reactor (ACR-1000), incorporate design modifications that further reduce tritium and other off-site emissions. This is in keeping with the ALARA principle ("As Low as Reasonably Achievable") of reducing radiation exposure to the lowest practical value, regardless of actual health impact. "Tritium Studies: Standards and Guidelines for Tritium in Drinking Water", Canadian Nuclear Safety Commission (CNSC), 2008 July. Osborne R.V., "Tritium in the Canadian Environment: Levels and Health Effects", March 2002. Osborne R.V., "Tritium in the Canadian Environment: Questions and Answers", June 2002. Several epidemiological studies of cancer (especially leukemia) and other disease incidence, birth defects, mortality, and other abnormalities have been conducted in communities near CANDU nuclear stations and other nuclear facilities in Canada. As expected by the low levels of radioactive emissions measured to date, there has been no evidence of a negative health effect in these populations. R.C. Nair, J.D. Abbatt, G.R. Howe, H.B. Newcombe, S.E. Frost, "Mortality Experience Among Workers in the Uranium Industry", University of Ottawa, Eldorado Resources Limited, National Cancer Institute of Canada. "Port Hope Harbour Area of Concern: Health Data and Statistics for the Population of the Region (1986 � 1992)". A Technical Report for the RAP community, Great Lakes Health Effects Program, Environmental Health Effects Division, Health Protection Branch, Health Canada. The first answer to this question is obviously "Yes" since radiation therapy is responsible for extending the life of many people and the application of radiation and radiopharmaceuticals has led to greatly improved medical diagnoses and subsequent treatment of injuries and diseases (see related FAQ). More indirectly, applications of radiation and radionuclides in industry have led to economic benefits that have improved living standards and, consequently, better health. But the question as posed often is referring to small doses of radiation and the direct effects on the individuals exposed. Here, the story is much more complicated. All living organisms have evolved and exist in the presence of ionizing radiation. Such a situation can lead to the speculation that organisms have "learnt" or "adapted" to cope with the damaging effects of ionizing radiation and, indeed, biological processes have been found that do repair damage to cellular constituents like that caused by ionizing radiation. One can press this idea further and ask whether the stimulation of such repair processes by the damage caused by ionizing radiation results in the organism being able to cope better with other subsequent potentially damaging agents, such as from further radiation exposures. Again, this type of effect has actually been observed in some studies with animals. One can ask whether such stimulation has become an essential feature of life and that without it, organisms will not be as healthy and, further, that a little more ionizing radiation might have a beneficial effect on the life of an organism-in other words, a hormetic effect. There is certainly evidence for all these effects from particular experiments with animals. The question is to what extent they may be generally applicable to humans at the normal levels of radiation exposure. The damaging effects of radiation on health are well documented. Indeed the effectiveness of radiation therapy relies on the killing capabilities of radiation. Doses of ionizing radiation much smaller than those used in therapy are known to increase the likelihood that some kinds of cancer will occur sometime (years) after the exposure. This was recognised, more than 50 years ago, in the increased incidence of leukaemia in various groups that had been exposed to radiation: children after they had been exposed to X-rays for various medical reasons during infancy or prenatally, radiologists, and the Japanese survivors of the Hiroshima atomic bomb. On the basis of these observations, the International Commission on Radiological Protection (ICRP) concluded (in 1958) that the most conservative approach for protection was to assume that the incidence of leukaemia would be proportional to the accumulated radiation dose although the Commission recognized that there could be a dose below which there would be no effect - i.e., a threshold. A similar assumption was made for the induction of bone cancer by radionuclides, such as radium, that concentrated in bone after being ingested. Since then, data have become available for the induction of other cancers by radiation and these data generally support the idea that the increased incidence of these cancers is proportional to the accumulated radiation dose for doses above about 100 mSv. It has been possible to estimate quantitatively the relationship between radiation dose and increased incidence of cancers (the "risk coefficient") that do appear to be induced by radiation. The Japanese survivors of the atomic bombs in Hiroshima and Nagasaki have provided most data for this. For doses below 100 mSv, it is not possible to decide from these data what the relationships are between radiation dose and the incidences of the various cancers. The assumption for protection purposes continues to be that the increase in incidence of cancer is proportional to the increase in radiation dose, all the way from zero to doses where effects have actually been observed. This is the "linear non-threshold" model (LNT model) that is the basis for standards and regulations on radiation in use around the world. A widely-held view is that this assumed model is "reasonably conservative" – that is, it errs on the safe side without going overboard. It has the practical advantage that protection against any particular source of radiation can be considered on its own without previous radiation doses (for example from a medical examination, or from radon at home) having to be considered. There is dissent on the appropriateness of the LNT model, though, in both directions, and advocates of the conflicting positions can point to experimental data in support of their claims. The suggestion that the LNT model under-estimates the actual risk is based on some selected data from population studies (childhood leukaemia from nuclear test fallout) and on experimental observations that some animal cells that are close to a cell that has been hit by radiation appear to be genetically affected even though they have not been hit (the so-called "by-stander" effect). However, this suggestion is generally regarded by radiobiologists and epidemiologists as having no sound scientific basis. The suggestion that the LNT model over-estimates the actual risk is based on the results of experimental studies with cells and animals and on the observations from some studies of the effects of radiation on groups of people. There is the view that there is a threshold below which radiation doses have no harmful effect. There is also the view that some increases in radiation exposure have a beneficial effect on health (an effect called "hormesis"). Even with the much more extensive data now available than was the case when the LNT model was first adopted, it is still not possible to determine unequivocally whether there is or there is not an increased risk of cancer at a doses of a few tens of mSv. There is strong evidence, for example, that the risk of cancer following internal contamination by alpha emitters does not follow the LNT model; there appears to be, effectively, a threshold. In the case of the Japanese atomic bomb survivors, the estimates of the incidence of leukaemia below doses of about 200 mSv are not significantly raised. Some scientists have interpreted the leukaemia data as indicating a reduced incidence in this dose range but, in reality, the statistical variation weakens this interpretation. There have been other studies, such as of human populations that live in regions with high natural background radiation (tens of mSv per year), or of animals in the region around the Chernobyl nuclear power plant, where the absence of effects or evidence of beneficial effects have been claimed but none of these studies has overcome statistical limitations and practical difficulties. Evidence for beneficial effects on human health from radiation exposures continues to be much sought after but, so far, it remains elusive. Given the absence of unequivocal evidence for any harmful or beneficial effects at low doses, there is no justification for trying to estimate, with the ICRP risk coefficient mentioned above, increases in cancers in a population that has received small increases in radiation doses. R.L. Kathren, "Pathway to a Paradigm: The Linear Nonthreshold Dose-Response Model in Historical Context: The American Academy of Health Physics 1995 Radiology Centennial Hartman Oration", Health Physics, 70, 5, May 1996. Biographical sketch of Richard. V. Osborne B.A., Ph.D.
Dr Richard V. Osborne, a biophysicist, retired from Atomic Energy of Canada Limited in 1998 where he was director of the Health and Environmental Sciences Division after a career spanning four decades, including 20 years as a research scientist leading a team specializing in tritium health physics. He was the first President of the Canadian Radiation Protection Association and has been Vice-President of the International Radiation Protection Association. He has worked for a variety of international agencies, including Canadian representative to the United Nations Scientific Committee on the Effects of Atomic Radiation, and Vice-Chairman of International Commission on Radiological Protection�s Committee on the practical implications of the Commission�s recommendations. He currently consults, as Ranasara Consultants Inc., in the general area of radiological protection. The Canadian Nuclear Safety Commission (CNSC) is Canada's "nuclear watchdog", established under the Nuclear Safety and Control Act (NSCA, passed March 1997; in effect May 2000). The CNSC was formerly known as the Atomic Energy Control Board (AECB), under the Atomic Energy Control Act of 1946. The CNSC is an independent, quasi-judicial administrative tribunal and regulatory agency that reports to Parliament through the Minister of Natural Resources. The CNSC regulates the use of nuclear energy and materials to protect health, safety, security and the environment, and to respect Canada's international commitments on the peaceful use of nuclear energy. The CNSC�s mandate does not include regulating for economic objectives. Nuclear regulation is solely federal jurisdiction, and the CNSC has no provincial counterparts. The CNSC consists of two components: a Commission tribunal and CNSC staff. CNSC staff is responsible for the following: providing advice to the Commission tribunal; implementing tribunal decisions; and enforcing compliance with regulatory requirements. The CNSC regulations apply to power and research reactors, nuclear research facilities, uranium mines and mills, uranium refining and conversion facilities, nuclear fuel fabrication facilities, heavy water production plants, radioisotope production and processing facilities, particle accelerators, radioactive waste management facilities, packaging and transportation of radioactive substances, and any handling and storage of radioactive substances. Licences are granted by the CNSC for all aspects of operation involving the above facilities and activities. Licensees are required to prove to the CNSC that their facility or activity is acceptably safe, under the requirements of the NSCA, before a license is granted or renewed. The approach to safety assumes that nothing is 100% risk-free (i.e. "absolutely safe"), but that risk can be minimized through multiple layers of verifiable protection. This approach includes external risks from both natural and man-made causes. For example, the CNSC specifies the levels and type of security that are required at nuclear facilities. In Canada nuclear power plants are defined as "Class I" nuclear facilities under the NSCA, and require CNSC licences prior to each of the five phases of a nuclear plant's lifecycle: site preparation, plant construction, plant operation, site decommissioning, and site abandonment. The process followed at each of these licensing steps includes a public hearing with opportunity for public input. In addition, the licensing process for a nuclear power plant in Canada proceeds only after approval is granted through the federal Environmental Assessment (EA) process under the Canadian Environmental Assessment Act (CEAA, 1992), involving the convening of a EA Panel and further public hearings. The EA process identifies whether a specific project is likely to cause significant environmental effects, determines whether potentially significant adverse effects are identified and mitigates to the extent possible. The CNSC is an independent agency of the Government of Canada. Its operations, meeting, and reports are open to public scrutiny. In 2007 the CNSC commissioned a study by a third-party expert on public-sector governance, examining the role and importance of regulatory independence in the administration of Canada�s nuclear regulatory regime. The report concluded that, although some gaps in public communication exist (particularly with NGOs) that may lead to a perception of non-transparency, the practices and procedures of the CNSC do ensure independent oversight. In particular, the report found that "there are practices within the commission itself to ensure legitimacy and voice, including strict guidelines to ensure that there is no conflict of interest." "Licensing Process for New Nuclear Power Plants in Canada", CNSC. "Regulatory Independence: Law, Practice and Perception - A Report to the Canadian Nuclear Safety Commission (CNSC)", Institute of Governance, March 2007. As a licensing requirement, nuclear reactors must be qualified to withstand the level of seismic activity that is expected for each individual reactor location. Seismic qualification is a common component of civil and mechanical design, and nuclear reactors do not differ from any other major infrastructure in this respect. The same robustness and defense-in-depth approach that assures safety and security of a nuclear plant plays a major role in its seismic qualification, and often provides a level of conservatism that continues to protect even during beyond-design-basis events. The general conservatism inherent in this qualification was evident following the July 16, 2007 Richter 6.8 earthquake on the northwest coast of Honshu, Japan, causing $100 billion in damage, killing 11 people, injuring 1000 others, flattening hundreds of homes, and leaving about 9,000 immediate refugees. The large Kashiwazaki-Kariwa nuclear plant was located only 16 km from the epicentre, and experienced seismic activity that was approximately twice that to which it was built according to the code at the time. Despite suffering this "beyond-design-basis" event, all four operating reactors at the plant were safely placed in a shutdown state. A small amount of contaminated water escaped to the environment during the earthquake, but the reported specific activity of this water (90,000 Bq	in 1200 litres) is approximately that naturally found, on average around North America, in cow's milk. 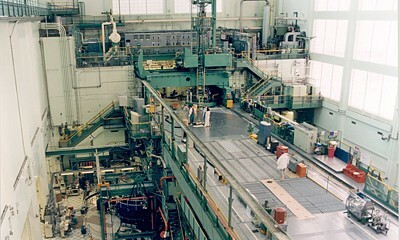 The Kashiwazaki-Kariwa plant required extensive requalification of its systems following the earthquake, but in terms of off-site radiological consequences the plant's safe shutdown was a testimony to the ability of conservative safety culture and defense-in-depth philosophy to manage even the unexpected. The following is a description of the events and technology behind an extended (one-month) shutdown of NRU reactor at AECL Chalk River Laboratories (CRL) in November and December 2007, which prompted highly-publicized concerns about a worldwide medical isotope shortage. This description is provided by the author for the purpose of explaining a complex situation to the public, and does not represent an official account by AECL, the CNSC, or the Government of Canada. 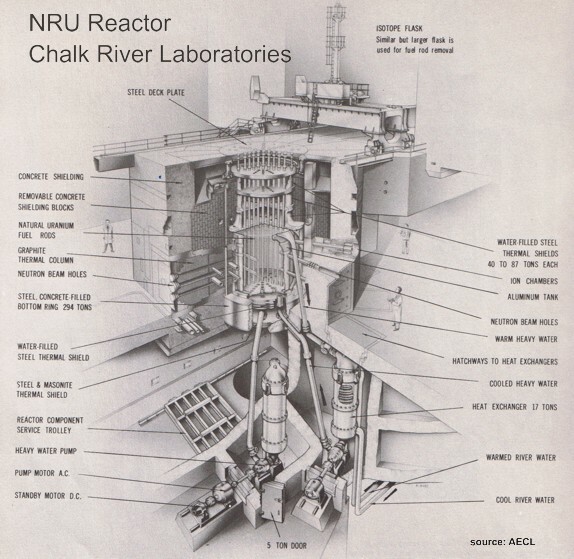 The NRU is a 135 MW(thermal) research reactor at Atomic Energy of Canada Ltd. (AECL) Chalk River Laboratories, about two hours northwest of Ottawa, Ontario. The NRU began operation in November 1957 and recently celebrated its 50th anniversary. The duties of the NRU include irradiation testing of reactor fuels and materials, neutron beam production, and radioisotope production (see related FAQ). The NRU is not an electricity-generating reactor, like CANDU. The power of the NRU reactor, 135 MW, is about 5% the power of a CANDU electricity-generating reactor. An unexpected one-month shutdown in November and December 2007 prompted world-wide concern about a shortage of crucial medical radioisotopes supplied by the NRU reactor to MDS Nordion (see related FAQ). The shutdown was prompted by a decision of the Canadian Nuclear Safety Commission (CNSC) that operation without connection of two emergency-use coolant pumps to a recently installed hazards-qualified (including earthquake) Emergency Power Supply (EPS) would be in violation of CRL's operating licence. Atomic Energy of Canada Ltd. (AECL), the operator of CRL and NRU, at that time had no choice but to continue the regularly-scheduled maintenance shutdown of the NRU reactor until the installations were complete and NRU was deemed to be back in compliance with its operating licence. Shortly after the shutdown, AECL submitted a safety case to the CNSC that supported operation of NRU for a limited period (120 days "time at risk") with one of the emergency-use coolant pumps (#105) connected to the EPS. 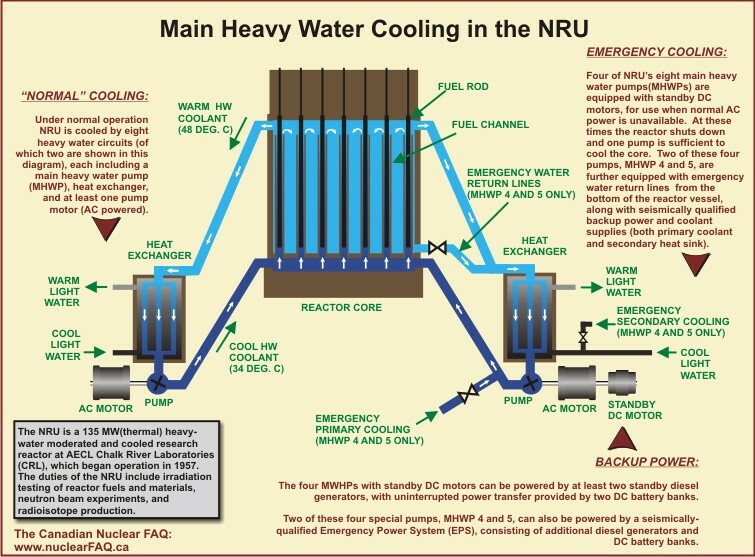 This safety case was based on the observation that (a) cooling of NRU is backed up by multiple redudant power systems, (b) one pump is sufficient to cool the reactor in an emergency, and (c) an unlikely catastrophic natural disaster (such as a thousand-year earthquake) would leave one pump with normal backup and EPS power supplies, backed up by one pump with only the normal backup power supplies. During the 120 period of operation in this enhanced safety condition, AECL proposed to connect the second emergency-use pump (#104) to the EPS system, and thus achieve the redundancy of availability required by its operating licence. Some background on NRU's cooling system is pertinent here. The diagrams1 on this page illustrates two of NRU's eight coolant loops, each with a heavy-water coolant heat exchanger, pump, and an AC pump motor. One of the pumps in each figure represents the four NRU coolant loops equipped with a backup ("standby") DC motor that can be powered by a number of sources of emergency DC power, including two backup diesel generators and two backup DC battery banks. Of the four NRU coolant loops thus equipped, any one is enough to remove the decay heat of the reactor and thus provide necessary cooling in an emergency. However, two of these coolant loops (designated P-104 and P-105) have additional features (see second diagram) that allow them to be credited for continuing to cool the reactor even in extreme safety cases when cooling by the other six loops is not available, such as after a catastrophic natural disaster (e.g. "thousand-year" earthquake). This feature relates to their ability to take return flow directly from the bottom of the NRU moderator tank (see diagram), whereas normal operation for the pumps is to take return flow from the top of the tank, and supply it to the bottom. This additional feature therefore allows two pumps (4 and 5) to continue cooling the fuel even if the integrity of the moderator tank is lost. Since one pump is sufficient to cool the reactor, in this unlikely circumstance the reactor's design still provides redundancy of backup cooling capability. The above configuration of backup cooling systems describes the NRU reactor as it operated for almost 50 years, licensed as "safe to operate" by the CNSC. More recently, however, the CNSC has required NRU to upgrade certain systems to modern standards, including installation of a special hazards-qualified (including earthquake) Emergency Power Supply (EPS) which would provide backup power even in extreme natural disasters. AECL installed seven such upgrades, of which the EPS was one, as a condition of its August 2006 operating licence for CRL. The EPS was connected to several systems, but the connection to backup motors for pumps 4 and 5 was considered by AECL to be an item additional to the licence, and thus something it had more time to implement following the granting of the licence (but no less essential). During the November 2007 maintenance outage the CNSC disagreed on this point once it came to light, and thus ruled that restarting NRU at that time would constitute a violation of CRL's operating licence. Subsequently, when consideration by the CNSC of the "one-pump, 120-day solution" safety case was deemed by the Government of Canada to not be forthcoming in a timely manner (based on the urgency of the global medical radioisotope supply needs), it asked Parliament to step in with legislation to expedite the process, acting upon consultation and advice from independent technical experts on reactor safety. Both Houses of Parliament passed the legislation unanimously, and the NRU reactor was restarted on December 16, 2007. The installation of the second pump connection proceeded during scheduled outages in NRU's production schedule, and was declared complete 48 days later on February 2, 2008. Canadians can be reassured that the safety of NRU was never reduced at any time during (or as a consequence of) the events described above, and AECL and the CNSC are in complete agreement on this. At issue was a second Emergency Power System connection that would essentially constitute a backup to at least eight other backup power supplies (regular "Class 1" DC backup power supplied by two AC generators and two DC battery banks, plus one backup hazards-qualified Emergency Power Supply - itself consisting of two AC generators and two DC battery banks), providing an additional margin of redundancy to an already multiply-redundant safety system, for the purposes of assuring safety in the event of a catastrophic natural disaster (e.g. a "thousand-year" earthquake). In terms of risk, AECL estimated the probability of a major catastrophe (flood, fire, earthquake, etc.) challenging the safety systems of the NRU reactor prior to the November 2007 shutdown to be approximately 1 in 1000 years (i.e. governed mainly by the thousand-year earthquake risk), whereas with one critical EPS pump connection (i.e. the situation at NRU's legislated restart on December 16, 2007) the risk was estimated to be about 1 in 50,000 years (2.1x10-5/year), and with both critical EPS pump connections (i.e. the situation as of February 2, 2008) the risk was approximately 1 in 1,800,000 years (5.4x10-7/year). AECL's proposed "time at risk" of approximately 120 days' operation was calculated to reduce the one-pump risk by another order of magnitude (i.e. to 10-6) to render it more acceptable. The difference of opinion between regulator and licensee was, rather, a matter of licence compliance. It also raised important questions of public risk balance, regarding the extent to which the health and safety risk to Canadians due to NRU operation (under modified safety enhancements) must necessarily be weighed against the risk due to continued stoppage of medical radioisotopes by the world's major supplier. This was the question reviewed by the Parliament of Canada, acting upon independent expert advice, when it made its decision to legislate NRU's 120-day return to service under AECL's interim safety case as described above. At issue, specifically, was the scope of the CNSC's mandate with regard to medical radioisotope usage: the "Objects" section of the Nuclear Safety and Control Act, states, in part, that the object of the CNSC is "to regulate the development, production and use of nuclear energy and the production, possession and use of nuclear substances, prescribed equipment and prescribed information in order to (i) prevent unreasonable risk, to the environment and to the health and safety of persons, associated with that development, production, possession or use, [...]" In dealing with the NRU situation in December 2007, the Government of Canada clarified that this part of the Act does include the use of medical radioisotopes, and thus the CNSC must henceforth take such usage into account during its deliberations. April 11, 2009: The Federal Court of Canada rules that the federal government's dismissal of CNSC President Linda Keen was legal. July 28, 2008: The independent consultant's report (Talisman International LLC) on the NRU incident, commissioned jointly by AECL and the CNSC, is released to the public. It includes specific recommendations and management reponse by both parties. Media story (Globe & Mail) on the Federal Court of Canada's ruling that the federal government's dismissal of CNSC President Linda Keen was legal. The independent consultant's report (Talisman International LLC) on the NRU incident, commissioned jointly by AECL and the CNSC, July 2008. Opinion of Jatin Nathwani, University of Waterloo, published in the Globe and Mail, 2007 December 14: "Ottawa calls it right on Chalk River row". Opinion of John Waddington, former Director General of CNSC, published in the Ottawa Citizen, 2007 Dec. 17: "Canada's safety watchdogs can learn some new tricks". Opinion of Jeremy Whitlock (author), published in the Ottawa Citizen, 2007 Dec. 21: "Reactor outage was issue of compliance, not safety". On January 29, 2008, the former President of the CNSC, Linda Keen, testified before a Parliamentary Committee that the risk of fuel failure in the NRU reactor was "1 in 1000 years", and claimed this to be a thousand times less than the "international standard". These claims are refuted by AECL. Op-Ed of John Waddington, former Director General of CNSC, published in the Ottawa Citizen, 2008 February 8: "Never a real nuclear danger". 1The scanned 3-D drawing is from the 1960 AECL public relations booklet "An Outline of the Activities of Atomic Energy of Canada Limited". Note that the fuel for NRU was natural uranium at the time of this publication. It was converted to HEU in 1964, and again to 20%LEU in 1992. While both atomic bombs and nuclear reactors make use of the energy from a nuclear fission chain reaction in uranium or plutonium, the similarity stops there. For a nuclear explosion, it is required to bring together a critical mass of fissile material (uranium-235 or plutonium-239) extremely quickly and release an enormous amount of energy in a matter of milliseconds. As with any conventional "bomb" the defining characteristic is a large amount of energy release within a contained area in a very short (almost instantaneous) time frame. For example, a gallon of gasoline poured over a driveway and ignited is a "fire"; a gallon of gasoline ignited all at once while still in a can is a "bomb". containing the rapidly multiplying fission chain reaction long enough for a large number of fissions to take place before the assembly blows itself apart. The critical mass of uranium or plutonium is maintained in a subcritical state prior to the explosion either by dividing it into separate pieces that are physically separated (a uranium weapon), or by using an amount that is less than one critical mass at normal densities and pressure (plutonium weapon). In a uranium weapon at the moment of detonation, the two pieces of uranium are brought together as fast as possible, typically using a gun barrel to fire one piece of uranium at another. In a plutonium weapon, it turns out that this gun-barrel velocity would not be sufficient to overcome the tendency of the plutonium to start chain-reacting before it could be properly assembled; therefore, a more complex arrangement is used whereby a sub-critical mass of plutonium is made critical by compressing it with a spherical arrangement of conventional explosives. Whatever the technique, the basic requirements are the same: fissile purity, fast neutrons, and fast assembly speed. In contrast, a nuclear reactor is designed to "stretch out" the fission chain reaction so that it takes place over many decades, rather than milliseconds. In addition, reactors are designed for long-term economic and safe operation, therefore requiring a fuelling strategy that is as cost-effective as possible and a fission chain reaction that is completely controlable at all times. containing the reaction within several layered, protective boundaries, designed to contain pressure increases, radiation emissions, and coolant leaks under all credible accident scenarios. Since the fuel is natural or low-enriched uranium, it consists mostly of non-fissile uranium-238, which acts generally as an absorber that hinders the fission chain reaction. Reactors therefore only work by spacing the fuel sufficiently far apart to allow neutrons to slow down in regions removed from uranium-238 nuclei. Therefore, under any severe accident scenario that disrupts the geometry of the core, it is not only impossible to bring fissile material together fast enough to cause an explosive chain reaction, but it is also impossible to maintain any kind of chain reaction, given the low fissile content of the fuel itself. Therefore, although there are a number of credible accident scenarios that must be taken into account in the safe design of any nuclear reactor, the possibility of the reactor exploding like an atomic bomb is not one of them. On 11 March 2011, the T?hoku earthquake and tsunami (also called the Great East Japan Earthquake) struck the east cost of Japan, causing over 20,000 deaths and widespread destruction. It was the largest earthquake to hit Japan in recorded history (Richter magnitude 9), and the subsequent tsunami, with a peak wave height of 40 metres, travelled up to 10 km inland. The Fukushima Dai-ichi nuclear power plant was one of several nuclear plants affected by the disaster, but the only one to progress to a level of nuclear disaster - and is typically referred to as the "third" of the "triple disasters" associated with the earthquake. There are six reactors at Fukushima Dai-ichi of the Boiling Water Reactor (BWR) type, of which three were operating at the time of the earthquake. Shortly after the onset of the earthquake the operating reactors shut down and commenced cooling with backup generators, having lost off-site electrical power. When the tsunami struck roughly an hour later, however, it destroyed all backup power and fuel supplies, leaving the three recently shutdown reactors without cooling capability. Shortly afterward (within one to a few days) all three reactor cores suffered partial or complete meltdowns - their uranium fuel rods, without cooling water to remove the heat of radioactive decay of their fission products (which would have been in the range of 30-50 MW per reactor at the time that the tsunami struck), melting from the top down and collecting within the water inventory that remained at the bottom of the reactor core vessels. There was some breaching of the core vessel by fission products, leading to high radiation levels in each reactor building. As pressures and temperatures approached the limits of the containment structures, radioactive gases were vented into the reactor building. Included in these gases was hydrogen that subsequently exploded more than once as it concentrated near the top of several of the reactor buildings. The destruction of the superstructure of the reactor buildings led to increased radiation levels off-site, and the initiation of evacuations in the surrounding populations. The evacuations were prompted by the fear of further hydrogen explosions (allowing more radiation to escape the plant), and the early estimation that radiation doses to the public might exceed 20 mSv per year, or about 10 times the average background radiation dose from natural radiation sources in the environment. The 20 mSv/yr "action level" stems from international recommendations for emergency management following a nuclear accident, and does not indicate a threshold for health effects from radiation exposure. There is no observable effect of radiation exposure at this level, or several times greater than this level (and in fact some areas of the world, such as in Ramsar, Iran, experience natural background levels at 10 times this level). Based on what is known about the effect of radiation on human health, in particular its tendency to lead to cancer at levels much higher than what is observed in the region around the Fukushima Daiichi plant, it is not likely that any health effect will be observed from the increased radiation exposure in the population. There was much confusion on this point in the media and other public reports following the accident at Fukushima Dai-ichi. As levels of certain radionuclides in some food reached government-stipulated "action levels" this food was removed from public consumption until the levels returned to normal (one of the main radionuclides is iodine-131, for example, which decays away after a couple of weeks). It was not widely appreciated, however, that "action levels" are typically set thousands of times less than what would be considered dangerous to human health, and therefore the Fukushima accident did not lead to deadly levels of radiation in food and water supply. For example, in Canada the relevant "action levels" are determined by a projected dose of 1 mSv per year, or about one-third to one-half of a typical annual exposure from natural background sources. Note: this assessment is based on the known radiation exposures only. It does not include any health effects from the non-radiological impact of the Fukushima Dai-ichi accident, such as those stemming from the mass evacuation itself, or the stress and other hardship imposed by the fear of radiation exposure. Following the Fukushima Dai-ichi nuclear plant accident in 2011, which was initiated by a powerful earthquake and tsunami that destroyed all immediate ability to cool the nuclear fuel in three recently operating reactors, the Canadian federal nuclear regulator, the Canadian Nuclear Safety Commission set up a special Task Force to determine how safe Canadian CANDU reactors are against conceptually similar low-frequency, high-consequence natural disasters, and to compile a list of lessons learned. The Task Force, in its final report concluded that the CANDU fleet is safe against such threats, due to the "defence-in-depth" strategy of reactor safety that provides robust and multi-level barriers against a range of scenarios - but also made a number of recommendations that could improve safety even more (see above link). One of the main differences between the CANDU design and that used at the Fukushima Dai-ichi plant is an abundance of backup cooling supply from water inventory around the core. The CANDU core is an enormous machine immersed in layers of water, starting with its own heavy water moderator and reflector tank, which provides passive heat removal in a postulated event involving loss of power and back-up power supplies. The core of a CANDU reactor can also cool itself by the natural buoyancy of its coolant when heated: it rises through the external pipework to the steam generators, where it is cooled and returns to the core - all without electrical power supply. There is a large inventory of water available to the steam generators for ultimately removing this heat, and beyond this it can be relatively easily topped up. Another significant difference is the existence of a robust, large containment in CANDU plants, the importance of which was underscored by the Fukushima event (where the reactor design relies on much smaller containment and constant suppression of steam buildup to manage pressures). The analysis of such extreme events in CANDU reactors has been a part of CANDU safety design since its inception, but this area is always improving its capabilities and learning as technology advances and experience around the world grows. The large water inventory in CANDU, along with its large and robust containment, capability for cooling by natural buoyancy without external power supply, and robust (and well-protected from likely hazards) back-up power supplies, provide a strong assurance that it would survive the class of extreme, once-in-millennium event that destroyed the Fukushima Dai-ichi reactors (as applied to the Canadian context). Additional lessons, such as those learned from the Fukushima accident, are carefully analyzed and incorporated.